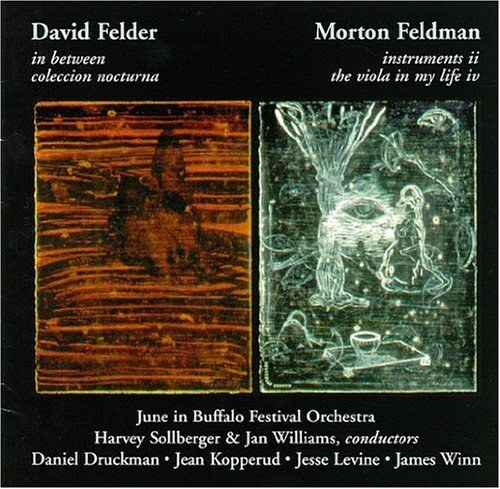 David Felder and Morton Feldman would be neighbors in a music dictionary, but they were also friends in real life; teaching at SUNY, Buffalo, and intimately involved with the school's June in Buffalo contemporary music festival. (Felder still is; Feldman died in 1987.) Musically, these two Americans don't have much in common other than excellence. Felder's music is dark, uncompromising, and violent in inspiration, and sometimes unleashes a ferocious energy. Alternating as it does on this CD, with Feldman's quiescent but taut style, reminds me of a razor blade floating on a still pool of water. The June in Buffalo orchestra is the pick up group to end all pick up groups, an assemblage of proven new-music virtuosi. Jean Kopperud, the clarinetist in Felder's Coleccion Nocturna, and Jesse Levine, as one of the violas in Feldman's life, are staggering. As with Mode's recent David Felder collection, this is essential, if hardly easy, listening.